The Two "Discourses" and the "Social Contract"
Individualist and communitarian. Anarchist and totalitarian. Classicist and romanticist. Progressive and reactionary. Since the eighteenth century, Jean-Jacques Rousseau has been said to be all of these things. Few philosophers have been the subject of as much or as intense debate, yet almost everyone agrees that Rousseau is among the most important and influential thinkers in the history of political philosophy. This new edition of his major political writings, published in the year of the three-hundredth anniversary of his birth, renews attention to the perennial importance of Rousseau’s work. The book brings together superb new translations by renowned Rousseau scholar John T. Scott of three of Rousseau’s works: the Discourse on the Sciences and Arts, the Discourse on the Origin and Foundations of Inequality Among Men, and On the Social Contract. The two Discourses show Rousseau developing his well-known conception of the natural goodness of man and the problems posed by life in society. With the Social Contract, Rousseau became the first major thinker to argue that democracy is the only legitimate form of political organization. Scott’s extensive introduction enhances our understanding of these foundational writings, providing background information, social and historical context, and guidance for interpreting the works. Throughout, translation and editorial notes clarify ideas and terms that might not be immediately familiar to most readers. The three works collected in The Major Political Writings of Jean-Jacques Rousseau represent an important contribution to eighteenth-century political theory that has exerted an extensive influence on generations of thinkers, beginning with the leaders of the French Revolution and continuing to the present day. The new translations on offer here will be welcomed by a wide readership of both Rousseau scholars and readers with a general interest in political thought. 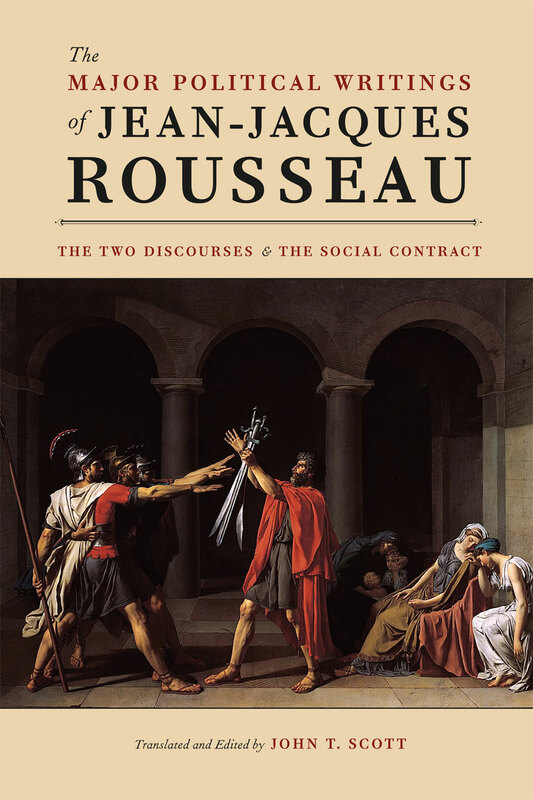 "This edition is the first to bring together, in a single volume, the three most important political writings of Rousseau—the First and Second Discourses and the Social Contract—in translations that combine great exactness with thoroughly readable English. The outstanding accompanying materials include notes that are illuminating but never intrusive, a chronology of Rousseau’s life, a bibliography, and above all a substantial introduction that offers a masterful overview of Rousseau’s notoriously complex thought. A genuine contribution that will aid scholars and especially students for many years to come." "Rousseau wrote that one should write ‘to persuade without convincing.’ He meant that a text should lead the reader to understand the world as the text itself did: it should not compel the reader. A translation that does not capture this quality of Rousseau’s writing will be untrue to it. John Scott’s new translations of three key texts capture Rousseau’s style wonderfully. His text is fluid, graceful, and as precise and effective an English rendering as can be achieved. In addition, Scott’s introduction is a model of clarity and intelligence, as are his explanatory notes. This is the English-language edition of Rousseau’s political writings to own." "John T. Scott’s fresh new rendition of Rousseau’s major political writings is a boon for scholars and students alike, balancing the literalness necessary for the rigorous study of Rousseau with crisp readability. As if this weren’t enough, Scott’s introduction and explanatory notes provide a succinct contextual discussion of Rousseau’s place in modern intellectual history. This edition will be the new standard Rousseau text for introductory and advanced courses in modern political philosophy."